"ERROR: [DataDirect][ODBC Sybase Wire Protocol driver][SQL Server] You can only use SELECT or SELECT INTO with the special table." 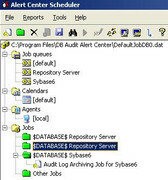 I uninstalled and again installed Central Repository, but this time I used a ODBC both to connect Central Repository (SQL Server) and another odbc for database I am auditing (Sybase), but now I can't create alerts nor reports. 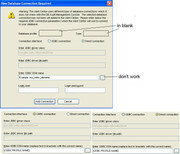 And the connections is ok.
Use ODBC to connect Central Repository (SQL Server) in the installation of Central Repository, not database url. Now I can choose 30 in 'Keep Days' and not have errors in archiving.